For week 44 of this #52Tech series, I take a look at Draft – an online webapp which is getting rave reviews for version control and collaboration. Note that there are several webapps and apps with similar names – I’ve previously profiled Drafts by Agile Tortoise, one of my favourite writing and text apps on the iPAD. There is also a Draft Android app sold through google play, which is not associated with Draft on the web. And there is also Final Draft – the top screenwriting app, which also has an iOS version available. Firstly, many editors and writers get good use out of MS Word, which has a lot of excellent version tracking features with colour coded bubble comments and track changes. But although Microsoft is shifting to cloud-based office apps, many of us access our writing apps still via desktops, and all our work is not accessible everywhere and anywhere. Draft works with Google Drive/Docs, the document route that a lot of writers use for quick writing tasks and sharing with groups of people, or collaborating with. Although Google Docs have long had a reputation for allowing easy sharing and collaboration, the environment doesn’t easily let you review changes or look at specific histories or versions of that document. To do this you must plough through colorcoded overwriting and individual revision lists. Draft works with Google docs, and imports/exports also from Dropbox, Box and Evernote. This is fantastic for me, as I do a lot of writing in Evernote, but it’s not the best for longer forms of writing. I can import in that starter doc from Evernote, and continue on in Draft. Another way to start a new Draft doc is to email into the Draft account. 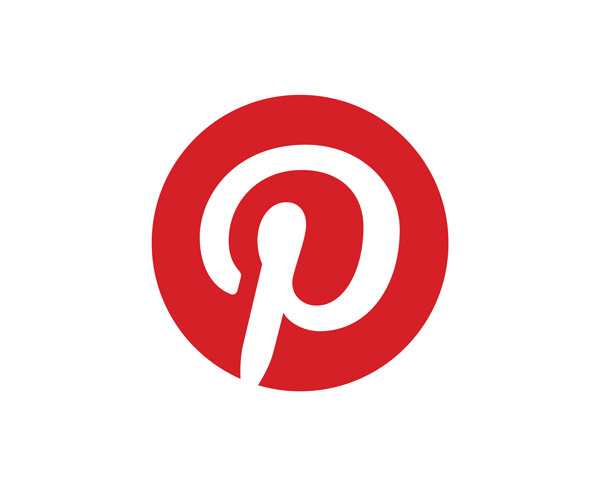 Most anywhere, like your social media, wordpress or blogger blogs, mailchimp, buffer, tumblr. You setup your publishing places within the settings area. As a standalone writing environment it provides a simple place to write, but then you can invite in others via email to review your documents, and allows you to track, review and approve the changes as they come in. You do this via a side-by-side comparison of the original and changed text . Invite individuals, or you can also share an entire folder to a team of people. 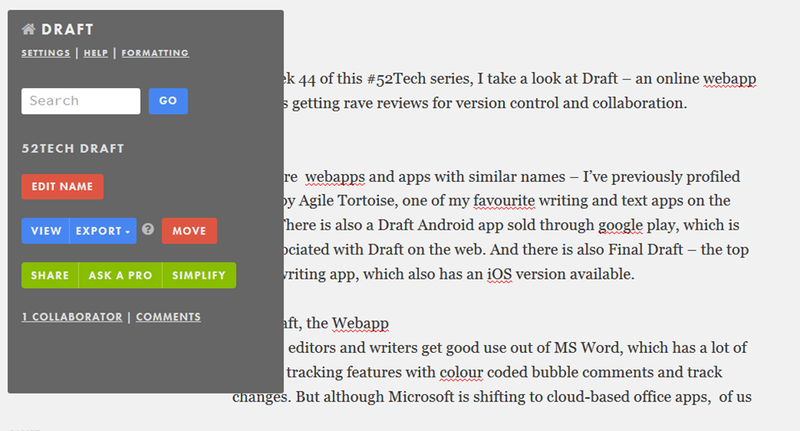 There is also a newer feature added, allowing you to comment out your writing, similar to how you can comment out code. Commented out writing remains in the text, just shifted over to the right. Aside from the free writing / collaboration / review environment (sign in using your Google account), there is also a Draft chrome extension. You can use this when browsing the web. If you find a big text field to fill in, say on a survey, you can click the Chrome extension and a Draft tab will open; type out your text into the new Draft, then click to paste it into the webpage text field. This works for your blog admin text editors, your gmail, twitter, anywhere you can write into. 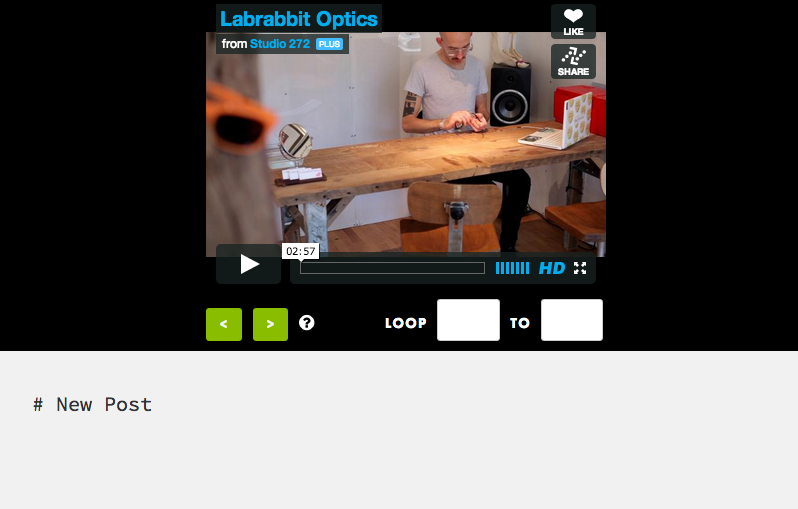 A newer feature of Draft is the ability to write transcripts for audio or video files – you can actually upload the file to be transcribed, or plug it into the Draft via an external url from Vimeo or Youtube. Draft provides forward or back arrow buttons to pause or return to the recording as you type out the transcription. Aside from the normal new Draft (document) mode, and new Transcript, you also can create a Presentation – a simple slideshow of text. 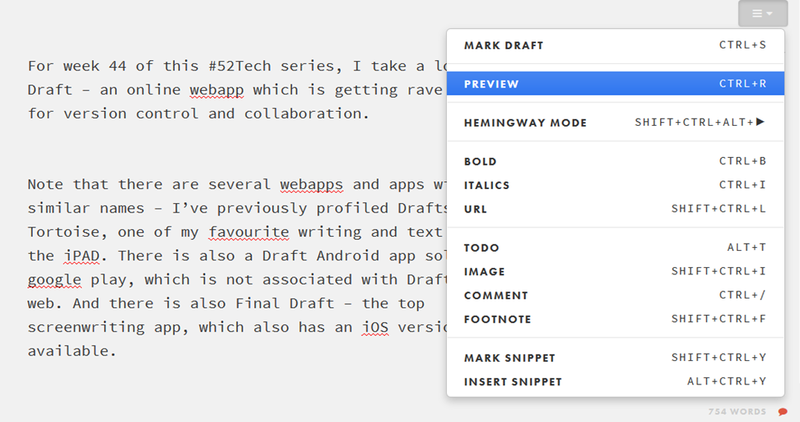 The Draft interface has several buttons which work to help your writing. Simplify uses an auto robot to attempt to simplify your text, should you overwrite. Once the changes are in as a collaboration, you can select to accept or ignore them. Ask a Pro sends your work to a staff of reviewers for suggested edits. This is the only area you pay for – 15 minutes of professional review costs $5 (or AUS$6 for me) or 45 minutes for $18). This service has made it very popular with a lot of pro-bloggers and content creators out there. Analytic reports showing wordcount, best writing times, etc. Word count is reported on, or found at the bottom of your document, and you can set a daily word quota too. Images can be inserted, and good for WriMo’s about to enter NaNoWriMo – Hemingway Mode – when turned on this mode won’t let you delete or edit your text. You just write, then edit later. Go to your home page and settings to change your font and background choice. The default is a source-code font on grey background. I prefer Verdana. In settings you can also set publishing places, your profile, and alerts.